I found out on Friday that I will have two speaking slots at the PASS Summit 2015 in Seattle, WA. The annual PASS Summit is always a lot of fun and a great learning and networking opportunity. Dynamic management views (DMVs) and functions allow you to easily see exactly what is happening inside your SQL Server instances and databases, with a high level of detail. You can discover your top wait types, identify the most CPU-intensive stored procedures, find missing indexes, and identify unused indexes, to name just a few examples. This session presents, demonstrates, and explains a complete set of diagnostic DMV queries that you can easily use to detect and diagnose configuration and performance issues in your SQL Server instances and databases. This session goes into exhaustive detail about how to interpret the results of each diagnostic query, including relevant background information about how to properly configure your hardware, storage subsystem, operating system, SQL Server instance, and databases to avoid many performance and scalability issues. How do you design a SQL Server 2014 infrastructure to meet specific Recovery Time Objective (RTO) and Recovery Point Objective (RPO) service levels? There are many aspects to consider, from technology choices and licensing to policies and procedures. This session outlines and compares the various high availability and disaster recovery technologies available in SQL Server 2014, showing how you can combine them to design and build a solution to help meet your goals. This session also teaches you how to formulate policies that enable effective use of technology in your organization. 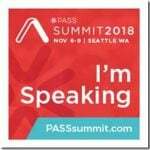 The entire SQLskills team will be speaking at PASS Summit 2015, including Paul Randal, Kimberly Tripp, Jonathan Kehayias, Erin Stellato, and Tim Radney. Before then, I will be speaking at a number of other events, some of which will be remote and some in person. On Friday, September 18, 2015 I will be doing a full day pre-con for SQLSaturday #441 in Denver, CO. This should be very interesting and a lot of fun. SQL Server is often I/O bound, but proving it to your storage or SAN administrator can be challenging! You will learn about the different types of storage that are available for SQL Server, and how to decide what type of storage to use for different SQL Server workload and file types. You will also learn useful tips and techniques for configuring your storage for the best performance and reliability for your workload. There will be extensive coverage on how to use disk benchmark tools like CrystalDiskMark 4.0, SQLIO and Microsoft DiskSpd, so you can confidently understand the performance that your I/O subsystem can deliver. We’ll also cover methods to effectively measure and monitor your storage performance from an OS and SQL Server perspective so that you will have valuable information and evidence available the next time you have to discuss I/O performance with your storage administrator. You will also learn a number of valuable OS and SQL Server configuration settings that will help you get the best I/O performance possible from your storage subsystem. Finally, I’ll be speaking at the Fall 2015 SQLintersection event in Las Vegas.